When Is Fake News Propaganda? Home > Our Blogs > Facing Today > When Is Fake News Propaganda? Facebook’s recent admission that social media can have a negative influence on democracy is the most overt acknowledgment to date that the spread of fake news could have impacted the 2016 US presidential election. The recent surge of misinformation on social media for political gain is a call to action for educators to take a closer look at fake news as propaganda. But when does fake news cross that line? While it’s only recently become a mainstay of modern headlines, fake news is not a new concept. Many Americans can recall standing in line at the supermarket and seeing headlines about UFO landings, secret celebrity illnesses, and other specious claims from tabloids like the National Enquirer. To understand the nuance between fake news and propaganda, you first have to have a clear definition of each term. The University of Michigan defines fake news as “...news stories that are false: the story itself is fabricated, with no verifiable facts, sources or quotes.” Propaganda, on the other hand, is defined as “generally [connoting] the selective use of information for political effect,” according to The National Endowment for Democracy. When you add the element of a social or political message behind a story that is fabricated, “fake news” begins to cross into the territory of propaganda. With 62% of adults in the US getting their news from social media and nearly one-third of young people admitting to sharing a news story online that they later found out was false, teaching media literacy has never been more important. Propaganda has been around in multiple forms, since the beginning of recorded history. In ancient Greece, playwrights made use of drama for their political, social, and moral teachings. Over time, fake news has created memorable (albeit dubious) quotes, like “Let them eat cake!” from Marie Antoinette. Propaganda has increasingly been in American lives since World War I, when the US government started using advertising to improve the public opinion of joining the war. 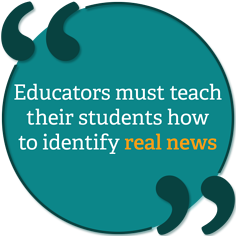 The significant rise of fake news as propaganda in recent years makes it critical that students have the skills they need to identify truth and discern bias. The 2016 US presidential election serves as an important example of this. Regardless of political affiliation, every adult in America was exposed to intentionally biased, factually misleading propaganda disguised as news on their social media feeds during the months leading up to the election. While some may think it’s ultimately innocuous, fake news as propaganda had real-life results. A December 2017 article on TIME Edge (TIME magazine’s digital resource for middle schools) explored how a protest organized on Facebook by the Russian Internet Research Agency led to a real-life protest (and counter-protest), which resulted in actual news coverage. This is just one instance of how fake news as propaganda can have physical outcomes. What sources does the writer use to back up his or her claims? Are the sources all anonymous or vague? What is the writer’s intention? Is there a strong slant or angle that is meant to sway the reader to think a certain way? Does it evoke a strong emotional reaction from the reader? The more something evokes an emotional reaction, the more the reader should be skeptical. What are other sources saying about the topic? Does it align with the original story that was read? If not, in what ways do other reports differ? Encouraging students to dig deeper into the content they see (both in and out of school) can help them become better citizens. These tips can be applied to any nonfiction source and will quickly become part of how students digest information. Incorporating current events into the classroom can help students engage with the content and understand how they fit into the world around them. With ever-increasing access to information, this kind of media literacy is a critical component to modern education. Use our Facing History's unit, Facing Ferguson: News Literacy in a Digital Age to help young people understand the role of journalism in a democratic society and how they can become responsible consumers and producers of news and information in the digital age. Lina Mai is an education editor at TIME Edge and a former public middle and high school teacher.